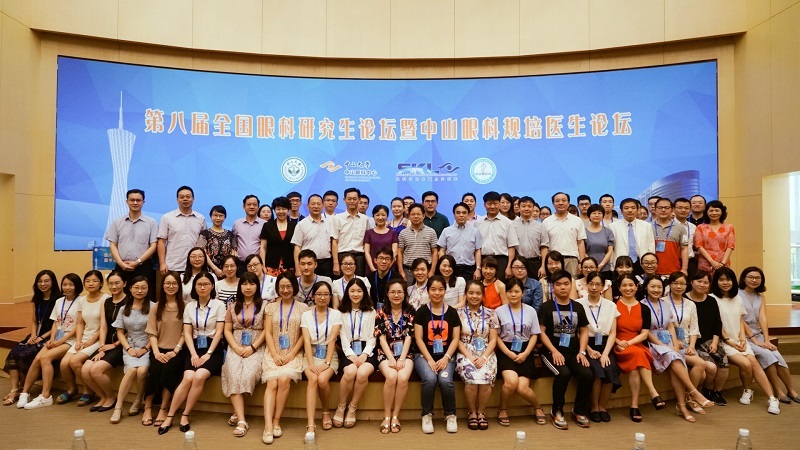 Young eye doctors from the top institutions across the country gathered in Guangzhou this summer. The Eighth National Ophthalmologic Graduate Students Forum and Zhongshan Forum of Young Ophthalmologist was successfully held in the ZOC - Zhujiang New Town branch court from August 19th to 20th, 2017. This forum was jointly organized by the Graduate School of Sun Yat-sen University, Zhongshan Ophthalmic Center, State Key Laboratory of Ophthalmology and Guangdong Provincial Medical Association. More than 200 graduate students and residency-training doctors and 31 experts from 34 excellent institutions attended the forum. This two-day forum comprised 4 sessions: expert forum, competition of research design and achievements, competition of case report and knowledge contest of ophthalmology. At the opening ceremony, Gao Jiuqun, the president of The Graduate School of Sun-Yat Sen University, warmly welcomed the experts and students and wished a successful and wonderful forum. Xia Dan, the Party Secretary of Zhongshan Ophthalmic Center, thanked for everyone’s support to the forum, and praised the young students for their enthusiasm. Zhongshan Ophthalmic Center, an institution including teaching, medical treatment, scientific research and blindness prevention, would strive to create a better platform for young students to learn and communicate, Xia Dan said. In expert forum, five professors made wonderful speeches. Professor Yang Peizeng, a Changjiang Scholar, gave a perfect interpretation about how to create a personal brand with his own experience. Liu Jiaping, secretary of Guangdong Provincial Medical Association, stated the idea of scientific innovation in policy and management. Professor Shi Ming, a recipient of the National Science Fund for Distinguished Young Scholars of China, inspired the young clinical researchers with his own pathway to become a clinic scientist. Professor Liang Dan, the director of Zhongshan Ophthalmic Center, shared her viewing on “ophthalmology leading personnel”. Furthermore, Professor Ge Jian, honorary chairman of the ophthalmic section of the Chinese Medical Association, introduced the frontiers and hotspots of Ophthalmology research in detail. All the five professors provided valuable suggestions to the attendees about the scientific innovation, personality development, foundation construction and the development of ophthalmology. All young students on the scene substantially benefits from the speeches. After a strictly screening procedure, 20 outstanding graduate students came to the stage to show their research design and results. In this part, the research design was innovative, and it covered the fundamentals, clinical research, scientific issues of ophthalmology. The comments of the experts were also brilliant, which includedthe innovation, feasibility, imperfection of the design and the oratory skill. Eight doctors shared their clinical case reports. The reporting form was refreshing, and the analysis logic was rigorous. The cases were performed with prominent highlights and features. Experts also seemed to be placed in the clinical first-line admissions scene. They worked with contestants to refine and solve problems in diagnosis and treatment. It was the first attempt to build the platform for both ophthalmic postgraduates and resident doctors in Zhongshan Forum.It was important to adapt the trend of training talent of ophthalmology and build the communication bridge for all the students. This forum got the good feedback and sincere thanks from all the participants. Meanwhile, the forum set up display of E-poster for hundreds of submissions, which was also highly attractive. At the end of the meeting, Professor Zheng Danying made a summary address. She was particularly grateful to all the staff, experts and students who devoted their efforts to the forum. She attributed the great success of the forum to their concerted efforts. Professor Zheng also said that the development of the edbiz and science of ophthalmology depended on the continuous efforts of all the young doctors. We thanked the Graduate School of Sun Yat-sen University for its support and guidance. We also thanked the training units and the ophthalmologic experts for their concern and encouragement. We would try our best to enhance the communication between our graduate-students and the training doctors in ophthalmology!